Ford consistently makes about 25,000 hybrid SUVs a year. While most are Escape Hybrids, the 2010 Mercury Mariner Hybrid runs on the very same powertrain, but with a dressier, sleeker style. There's also the Mazda Tribute Hybrid-again, the same vehicle underneath-though they are very low volume, and hence can be hard to find. The 2010 Ford Escape Hybrid remains a solid, competitive entry among compact family SUVs and crossovers. Its fuel efficiency is superb, and the optional mechanical all-wheel drive sets it apart from any other AWD hybrid crossover. TheCarConnection.com drives the 2010 Ford Escape Hybrid and brings you this comprehensive review that covers driving attributes and other up-close, on-the-road observations. TheCarConnection.com also researches reviews from other sources and presents you with some of the most useful ones here in an adjacent Full Review on the Escape Hybrid. Considering it was launched in 2004, the latest 2010 Ford Escape Hybrid compact SUV is both popular and durable. Completely redesigned for 2008, the Escape Hybrid was the first hybrid manufactured in America and the first hybrid SUV. Nervous about how long those hybrid motors and batteries will last? Consider that over 1,500 Ford Escape Hybrids are in regular use as New York City taxicabs! Ford has regularly upgraded the Escape's hybrid-electric powertrain during its life. The Escape Hybrid carries over its 2.5-liter inline-4 engine for 2010. The dual overhead-cam engine puts out 153 horsepower, with the electric motor boosting torque as needed. The Escape Hybrid can run solely on battery power with its engine off up to 25 mph, and in some limited circumstances up to nearly 40 mph. The combination of electric motor/generators in the hybrid system functions as an electronic continuously variable transmission (CVT). The gasoline engine always runs at its most fuel-efficient speed, regardless of how fast the car is traveling. Acceleration is acceptable if not spectacular, though the engine will howl when floored. But hybrid buyers look for gas mileage, and the 2010 Ford Escape Hybrid comes in at 34 mpg city, 31 mpg highway, according to U.S. EPA ratings. We tested a 2009 Escape Hybrid and averaged a consistent 30 mpg on a route with substantial 75-mph cruising. The all-wheel-drive version of the 2010 Ford Escape Hybrid has a crucial distinction from all its hybrid competitors: Its AWD system motivates all four wheels mechanically instead of driving the rear wheels with an electric motor, which can sometimes shut off in certain circumstances. We prefer the reliability of mechanical AWD as offered on the hybrid Escape. Ground clearance is substantial at 8.5 inches, though this Escape isn't meant to be a Jeep-like off-roader. Still, Ford's hybrid SUV is fine on gravel roads and exhibits excellent road-holding considering its height, mostly due to a suspension revamp two years ago. The 2010 Ford Escape Hybrid an upright, square SUV that looks larger than it is from a distance. Its 2008 design took it further into butch-SUV territory, which may not entirely square with today's desires--but it's obviously a Ford, similar to its larger truck brethren. Inside, seating room is decent for four adults, though the short bottom cushion of the rear seat makes it better for kids than taller adults. Visibility is good; everyone sits high up and the windows are deep and upright. Wind noise, however, is a downside. It's higher than we expected and not as well suppressed as in competing compact SUVs. The mirrors are noisy at speed, though we like their large size and rearward visibility. Our 2009 test vehicle also suffers a moaning howl right at the 2,000-rpm mark that makes us crazy, though we've not experienced that problem on any other Escape Hybrid. Instruments are easy to read in the 2010 Ford Escape Hybrid, with blue-green backlighting. The high-gloss black plastic surfaces on the dash and doors seem to attract dust like a magnet, though. Ford's Easy-Fuel system eliminates the gas cap to provide easier refueling. After playing with our test vehicle's optional LED interior lighting a few times, its choice of several different colors for floor, console, and cup-holder lighting begin to feel like a gimmick. We also aren't thrilled with the lack of integration between hybrid operating info on the instrument cluster and the console screen. One gauge in the cluster shows the battery charging and discharging, but the detailed fuel consumption data is only on the central console screen. We much prefer the newer 2010 Ford Fusion Hybrid, where both parts are integrated in graphical displays right in front of the driver. For 2010, Ford switches to electric air conditioning from an engine-driven compressor, which means the AC will run whether or not the engine is on-a major feature for buyers in hot and humid states. The folding rear seat might prove annoying to anyone who has to frequently alternate between cargo and rear-seat passengers. It requires all three headrests to be removed-but there's no place to stow them. Once the seat bottom is folded forward and the back flipped down, the load floor is flat and the Escape Hybrid offers 66.3 cubic feet of cargo space. Still, those headrests! Ford's SYNC interface to infotainment systems is simply better than most others, and they are justifiably proud of it. Drivers and passengers can pair (most) Bluetooth mobile phones and connect (most) MP3 players, then operate them with voice commands-improving safety significantly by keeping the driver facing forward with hands on the steering wheel. Other features and options include Sirius Travel Link, which provides real-time traffic data, weather info, navigation, and even local fuel prices. For 2010, Ford adds several new features, including the rearview reversing camera increasingly popular among families with young children. Another is an integrated spotter mirror that overlays convex mirrors aimed at the Escape Hybrid's blind spots on the top outer corners of both outside mirrors. The MyKey system electronically limits performance and stereo volume for designated teen drivers, and Ford's remarkable (if spooky) Active Park Assist measures parking spaces and steers the car into them. As a family vehicle, the 2010 Ford Escape Hybrid has to score well on safety, and it does. The Insurance Institute for Highway Safety (IIHS) names it a Top Safety Pick, and the National Highway Traffic Safety Administration gives it five stars in its front and side impact tests. Dual-stage front airbags and side-curtain airbags are standard, as are anti-lock brakes, electronic stability control, tire-pressure monitors, and traction control. The 2010 Ford Escape Hybrid looks the same as before, with practical and inoffensive styling inside and out. The second-generation Ford Escape Hybrid is entering its third year on the market, and reviews read by TheCarConnection.com show that the styling still wears well on the midsize SUV. The 2010 Ford Escape Hybrid is a mid-size, five-passenger hybrid SUV that Kelley Blue Book says "carries over with little change" from last year's model. Edmunds reports that the Ford Escape Hybrid "is available in two trim levels: base and Limited," with some noticeable cosmetic differences between the two. In particular, Edmunds references the "16-inch bright machined aluminum wheels" and "chrome exterior and interior accents" as the primary elements distinguishing the Escape Hybrid base and Limited models. Kelley Blue Book reviewers like the overall look, proclaiming it offers "a sort of rugged and refined style that's appropriate for both downtowns and campgrounds." The Escape Hybrid fits nicely into the Ford family, according to Cars.com, where reviewers contend that "the Escape Hybrid looks more like a Ford Explorer" than the first generation did. The Ford Escape Hybrid also sports the requisite "hybrid" badges that announce your eco-friendly aspirations to the world. The interior of the Ford Escape Hybrid is pleasant, if a little outdated. Edmunds asserts that the cabin "provides occupants with a simple and uncluttered" environment, and "at night, the interior is further enhanced by modern, ice-blue illumination." Kelley Blue Book reviewers point to the "upright dash" and "firm seats" as evidence of "a much more contemporary demeanor, but the overall feeling still seems a bit dated" when compared to competing models. Dated or not, ConsumerGuide is pleased to report that "the climate controls are simple to use," and the "redundant steering-wheel buttons and voice programming via Ford's Sync system help" make complicated functions more manageable. The 2010 Ford Escape Hybrid isn't the most powerful or engaging SUV to drive, but it does deliver on its main promise of exceptional fuel economy. The 2010 Ford Escape Hybrid is notable for Ford's claim that it is "the most fuel-efficient SUV on the planet," but in nearly every other performance aspect it is far from world-class. The Ford Escape Hybrid is a "full hybrid" model, meaning it employs both a gasoline and electric engine (two in AWD versions) and is capable of running exclusively on the latter. Edmunds reviewers list the Escape Hybrid's powerplant as "a 2.5-liter four-cylinder gasoline engine as well as two electric motors/generators that combine to produce 177 horsepower." On most hybrids, that sort of power output would be impressive, but on a vehicle as large as the Ford Escape Hybrid, 177 horsepower seems a bit paltry. Kelley Blue Book reports that, "according to Ford, the system delivers zero-to-60-mph acceleration equivalent to that of a 240-horsepower V6," but other reviewers aren't quite so impressed. ConsumerGuide, in particular, claims that "passing response is not strong, especially above 60 mph." The engines that underpin the Escape Hybrid's powerplant team up with "a 'gearless' continuously-variable transmission," according to Kelley Blue Book. Edmunds asserts that the transmission "provides seamless transitions between gas and electric modes," and TheCarConnection.com's editors are inclined to agree. One of the benefits of a continuously variable transmission is that it works "to keep the engine in the strongest part of its power band," according to ConsumerGuide, but your first time using one can be a bit unsettling, as the engine noise and pitch stay relatively constant during acceleration. Ford bills the Escape Hybrid as "the most fuel-efficient SUV on the planet," and while some manufacturers might contest that claim, the Escape Hybrid's efficiency is nonetheless impressive. Edmunds reports that the Escape Hybrid "gets 30 mpg in the real world," which nearly matches the EPA estimates of 34 mpg city and 31 mpg on the highway for front-wheel-drive versions. For those in the Snow Belt, the all-wheel-drive variant of the Escape Hybrid gets 30 mpg in the city and 27 mpg on the highway. Environmentally conscious buyers will undoubtedly rejoice over the Escape Hybrid's fuel economy, but those with more of a performance orientation won't be so pleased. Kelley Blue Book has good things to say about the "new electric power steering system [that] requires less effort from the driver," but ConsumerGuide complains that "the steering feels overboosted and numb, especially at low speeds." The Escape Hybrid also suffers from a heavier overall frame than conventional models, and Edmunds reviewers find that "the added weight from the hybrid components has a detrimental effect on handling and braking." ConsumerGuide agrees that the "braking [is] intermittently touchy at low speeds," but on the positive side, they note that the ride quality is "pleasant." Most other reviewers agree about the comfortable ride quality, with Kelley Blue Book reporting that the "Escape Hybrid transforms into a rather run-of-the-mill SUV, with ride and handling characteristics not significantly different than those of its competitors." The 2010 Ford Escape Hybrid high-utility body style provides more space than most hybrids, but materials quality could be a deal-breaker. The 2010 Ford Escape Hybrid is a midsize SUV that offers seating for five. While the Escape Hybrid is comfortable enough overall, the latest generation loses points for its subpar materials quality. Inside the Escape Hybrid's ample passenger cabin are seatbelts for five, and reviews read by TheCarConnection.com show that the Escape Hybrid is still comfortable even when all five are in use. Edmunds calls the cabin "roomy, but in terms of comfort and space the Escape is starting to feel its age." Reviewers at ConsumerGuide can't really tell, though, as they find "more than adequate headroom" up front, along with "comfortably supportive seats" and "good" legroom. Edmunds takes exception to the seating position, however, contending that "the seating position is too tall, which gives the driver the feeling of hovering above the controls." Rear-seat room is surprisingly good; ConsumerGuide calls the rear accommodations "another Escape strong point." Edmunds agrees on this count, claiming there is "suitable space for average-sized adults," and ConsumerGuide believes that "three adults will fit for short trips." The 2010 Ford Escape Hybrid benefits from a slightly larger cargo area compared to last year's model, and Kelley Blue Book raves about the "greater utility and capability." 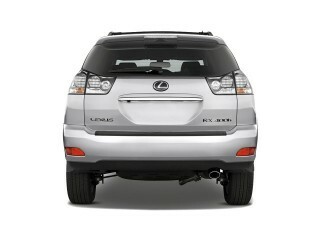 When the second row of seats is in place, Edmunds says that the cargo area "can accommodate 28 cubic feet of luggage." If that's not enough, Cars.com reports that "the rear seats fold in a 60/40 split to increase cargo capacity" to a cavernous 65 cubic feet. Inside the passenger compartment, ConsumerGuide observes that "small-item storage includes several bins, cubbies, and map pockets in all four doors." Ford's latest Escape Hybrid has a lot going for it, but reviews read by TheCarConnection.com invariably bring up build and materials quality as the Escape Hybrid's sore points. Kelley Blue Book laments that the latest Escape Hybrid "doesn't match the levels of refinement offered by many of its small SUV and hybrid competitors." ConsumerGuide simply deems the materials "disappointing overall," and remarks that the interior "imparts a low-buck atmosphere." The story's not all bad, however-on the new Escape, Ford makes the eco-friendly decision to use "seat fabric [that] is constructed of 100-percent recycled material," according to Kelley Blue Book reviewers. Despite the complaints about the build and materials quality, reviewers report that the cabin is well isolated from wind and road noise. Kelley Blue Book attributes the hushed interior to "thicker carpeting and laminated glass." ConsumerGuide's test drive reveals that "wind and road noise are present" inside the Ford Escape Hybrid, "but are not in significant quantity to be overly bothersome." The 2010 Ford Escape Hybrid returns with improved safety features that will definitely appeal to parents with driving-age children. The 2010 Ford Escape Hybrid builds upon the structural soundness of the 2009 Escape Hybrid by adding a number of new safety features. 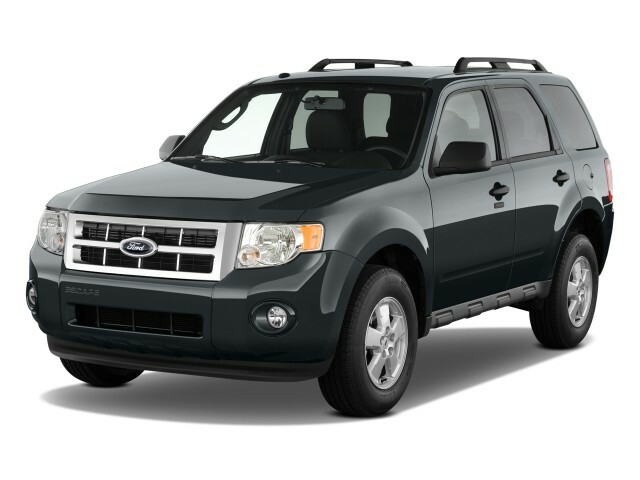 The 2009 Ford Escape Hybrid is an impressively safe vehicle, earning top marks in nearly all crash-test categories. The 2010 Ford Escape Hybrid starts down the same path, earning a perfect five-star rating in every NHTSA impact test. While the current Ford Escape Hybrid hasn't been tested by the IIHS, last year's model earned a Top Safety Pick Award from the Institute. TheCarConnection.com's editors expect that the 2010 Ford Escape Hybrid, which features the same chassis and general structure, will also score well in IIHS crash tests. Stay tuned to TheCarConnection.com for the latest updates on the 2010 Ford Escape Hybrid's crash-test results. You might not be able to see the Escape Hybrid's new safety features, but every time you start up the Escape Hybrid, you'll bring to life a long list of electronic safety aids. Kelley Blue Book reviewers observe that, "for 2010, Ford adds a bevy of new available features," including "an integrated blind spot side view mirror, MyKey programmable key, Active Park Assist parallel parking aid, [and] a rear view camera." Edmunds approves of the new "standard integrated blind-spot mirrors" to address the critical issue of visibility. Not that visibility is much of an issue on the Ford Escape Hybrid-ConsumerGuide reports that "visibility is very good in all directions." Beginning with the new 2010 Escape, Ford starts rolling out a new safety feature that they are dubbing MyKey. Edmunds says that the Escape Hybrid's MyKey will allow "parents to specify speed limits and stereo volumes for their teenage drivers." Considering that the teenage demographic is the most likely to be involved in an accident, this will likely prove an incredibly popular feature on the Escape Hybrid. The 2010 Ford Escape Hybrid also gets the expected range of typical safety features, including six airbags and standard anti-lock brakes on all four wheels. Kelley Blue Book reports that the "AdvanceTrac traction control with Roll Stability Control" is also included on each and every Ford Escape Hybrid. The 2010 Ford Escape Hybrid offers a lot of desirable features, but it's still a bit too expensive to be considered a strong value. The 2010 Ford Escape Hybrid doesn't exactly raise the bar with regards to features, but it does have enough high-tech goodies to (mostly) justify its price tag and keep owners satisfied. Ford's latest Escape Hybrid starts at just under $30,000 for the most basic model, with a fully optioned Limited model clocking in at over $40,000. Kelley Blue Book reviewers concede that "choosing the Escape Hybrid over a gas-only model will likely cost you more money up front than you'll end up saving at the pump," but many consumers will find the civic benefits of driving a hybrid to be worth the trade-off. Fortunately, the Ford Escape Hybrid offers more than just electric propulsion; as Edmunds points out, the Escape Hybrid boasts numerous "innovative high-tech features," despite being "pricey for its size." Kelley Blue Book reports that the Escape Hybrid is "equipped similarly to the XLT gas-only model" and comes standard with "dual-zone climate control, four-speaker AM/FM/CD sound system with auxiliary audio input jack" and full power accessories. Edmunds adds that the Escape Hybrid includes "the Sync system" and "a leather-wrapped steering wheel with audio controls." For consumers interested in the more luxurious Ford Escape Hybrid Limited, Edmunds states that the features list grows to include "a sunroof, rear parking assist, a rearview camera located in the rearview mirror," and "heated front seats and mirrors and multicolor ambient lighting." The SYNC system, which was co-developed with Microsoft, is one of the Escape Hybrid's most appealing tech features, and it allows drivers to operate their Bluetooth-enabled phones with voice commands. The 2010 Ford Escape Hybrid can be optioned with a number of extra features, some of which are virtually unknown at this price level. First and foremost, Kelley Blue Book is surprised to find an "Active Park Assist [that] uses sonar and the electric power steering unit to automatically guide the Escape into an open parallel parking spot," a feature "usually found only on super luxury cars." Edmunds is impressed with the parking system, reporting that it "works surprisingly well," especially given its technical complexity. Ford also recognizes that some consumers might have second thoughts about turning parking duty over to a computer, and Cars.com says "the driver can also override the system and steer the car, if needed." Kelley Blue Book lists some of the other available options as "DVD navigation with 10GB hard drive storage, rear view camera, MyKey...[and] integrated side step bars and roof rack crossbars." This has been a high quality car for several years.